So far, in five years of practice, I’ve had two clients come in for TMJ relief sessions who had previously seen multiple practitioners who worked inside their mouths to try to relieve their TMJ symptoms. They had seen chiropractors, chiropractic neurologists, Rolfers, dentists trained by the Las Vegas Institute (LVI), and/or other massage therapists. These two clients both told me, “No one has ever touched me there,” after I worked on their lateral pterygoids. These are small, hard to access muscles, and in my opinion, they are most often the key muscles to address to release jaw tension. It’s not that the other jaw muscles don’t contribute. They do, and in roughly 10% of the TMD cases I’ve worked on so far, one of the medial pterygoids is “the problem child” creating the most pain and dysfunction in the jaws. The external jaw muscles — the masseters and temporalises — also play a role in jaw tension but are never (that I’ve seen so far) the biggest contributors. 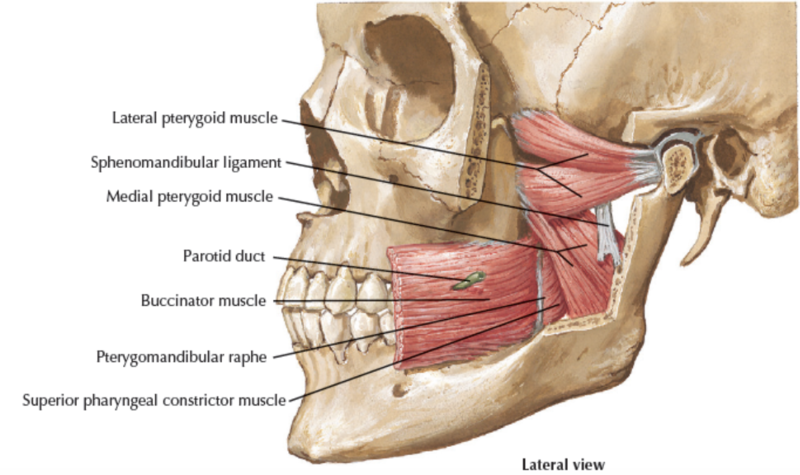 In other words, about 90% of the time when people have jaw pain from muscle tension, the lateral pterygoids are the main source. It’s not that these other intra-oral practitioners have nothing to offer. Chiropractors, Rolfers, and massage therapists have definitely helped me, and I’m not familiar with the others. Also, some LVI-trained dentists do receive specific training in treating TMJ issues — and I’m sure they can help with more complex or advanced problems. The only complaint I’ve heard about going to a physical therapist for TMJ relief is that they work aggressively, with little concern for patient comfort. I’m pretty sure that is because they are restricted by insurance companies to the amount of time allowed to address a given problem. If you can handle it, they probably will work on your lateral pterygoids. You can always talk to them first about what to expect. I don’t work with insurance, but even people living on a budget who are determined to get gentle, lasting TMJ relief have found a way to pay my reasonable rates. I’ve learned through trial and error that one 75-minute session provides relief, but it may not be lasting. For longer-lasting relief, 5 sessions in 4 weeks with support for habit change and self-care help retrain the jaw muscles to lengthen and relax. If jaw tension or pain resulting from jaw tension is your major complaint, and you’d like a sense of spaciousness in your TMJs (if you can even imagine how great that would feel), please seek a practitioner that works on the lateral pterygoids. I work as gently as possible. I never make any sudden moves. My sessions start with full body alignment to get you relaxed and progress toward the intra-oral work near the end. My referral partners include dentists, chiropractors, doctors, and massage therapists. I started a Facebook group, Word of Mouth: Resources for Jaw Pain/Dysfunction, for people who want to work on their jaw issues. You can ask questions and learn more there. I hope this information helps you ask informed questions when choosing a practitioner to relieve your jaw tension and pain. Not too long ago, I posted Orienting to stillness, orienting to motion, providing some options for people who are interested in exploring awareness. Today I want to share some experiences with orienting to space. First, a little backtracking. Starting in 2010, I wrote here about the 12 states of attention (and also here), which I learned from Nelson Zink on his website Navaching (which also included instructions for night walking), which sadly he has taken down. Reading his book of stories The Structure of Delight is an experience I highly recommend. It’s like no other book you’ve encountered, and if you’re interested in acquiring wisdom from a bunch of interesting characters, you’ll enjoy it. Update: This post was originally written in 2010, and it’s now 2018. Some things have changed. Nelson Zink has (mostly) retired and taken his website Navaching down, although you may be able to find it again in the future. I’ll let you know here when it’s up again. You can get a used copy of his book The Structure of Delight on Amazon. If you’re a fan of Nelson Zink and in particular his work on peripheral vision and nightwalking, you might be interested in attending a nightwalking training in August 2018 in Taos, New Mexico. Nelson will be co-teaching it with my friend Katie Raver. Details for Nightwalking are here. My most recent post, Refining Awareness, includes some instructions about using your vision to focus down to the pixel level, and then to open your vision and let everything come into your field of vision. These activities are actually based on a set of exercises called the 12 states of attention that I learned about and practiced and presented on, so that now I seem to have internalized them enough that I don’t consciously think about it. The three main senses we use are seeing, hearing, and feeling, or visual, auditory, and kinesthetic. NLP 101. Each of these senses can be experienced externally and internally. For example, I can see the computer in front of me, and I can close my eyes and remember the image or imagine the computer morphing into a piano. That’s Visual External and Visual Internal (remembered and constructed). You can further expand your sensory acuity by practicing using each sense as broadly and as narrowly as possible. Hence, look at a pixel, then let everything come in. Those states are Visual External Narrow (VEN) and Visual External Broad (VEB). You can do this with hearing as well. You can focus on one sound in your environment (or in your memory or imagination), and you can focus on all the sounds. The point is that through our conditioning, most of us come to favor some states and neglect others. If you enjoy having more resources, you can practice these states and gain awareness skills. You never have to be bored again, and you will reach more of your potential! So when I meditate and do a body scan, I may bring to awareness my skin, starting with my head and slowly going down my body to my foot, bringing each area into awareness (Kinesthetic External Narrow). Or I may attend to how my head, chest, and belly feel (Kinesthetic Internal Somewhere-Between-Narrow-and-Broad). When I do whole body awareness, I am using the Kinesthetic Internal/External Broad state of attention. The kinesthetic sense may actually be a lot of senses, including balance, knowing where my foot is in space, temperature, tactile, muscular, and so on. Emotions are usually classified as kinesthetic as well, since we feel them in the body. Wisdom is a broad state, no matter whether we’re seeing the big picture, hearing the cosmic OM, or feeling connected to the Source. Big Mind is a broad state, and that’s a skill gained from meditation. Check out Zink’s website and practice the exercises given, if you like. It will bring you gifts of knowing yourself and experiencing more of your full potential.